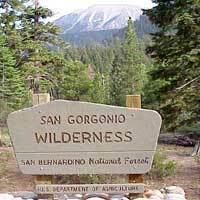 In and around Big Bear, you’ll find acres and acres of scenic nature to explore, including the Bighorn Mountain, Cucamonga, Santa Rosa, San Gorgonio or San Jacinto wilderness areas. Hiking Season in Big Bear begins as the snow begins to melt, usually June to October. Be sure to pick up a free day hiking permit from the closest ranger station before setting off on your adventure. For $6 the rangers will sell you a helpful trail map for any region but Bighorn. Please... leave no trace, only footprints when you walk in the forest. Right around Big Bear itself, most of the most enjoyable nature hikes for families start at the Discovery Center, like the WOODLAND TRAIL, a gentle mile and a half loop. The Center staff will provide you with a wildlife brochure that will help you identify plants, creatures and interesting geographical features you see along the way. If you want a jaw dropping glimpse of the Champion Lodgepole Pine, one of the largest of these giant trees in existence, take the aptly named CHAMPION LODGEPOLE PINE TRAIL. It’s less than a mile to this national treasure when you drive up Mill Creek road, then turn right on 2N11 and follow to the trailhead. The GRAY'S PEAK trailhead is moderate to difficult. You'll start out west of Highway 38 about .6 miles from Fawnskin near the Grout Bay Picnic area. The trail starts our leisurely but gets more aggressive once you pass the 7,920 mark at 2.75 miles and you're on the real Gray's Peak. There are boulders to climb so bring good hiking shoes. You can continue on the Hanna Flat Trail for another 4 miles making this hike a much longer round trip. More challenging trails can be found under "Biking Big Bear" on this site, since many paths like Grandview/Pine Knot Trail, Grout Bay, John Bull and Cougar Crest are shared horse/bike/walking paths. Especially when considering a longer or more challenging hike, bring plenty of water and check with the ranger station for the trail conditions before starting out. Or, for a completely decadent version of a hike, head over to the Knickerbocker Mansion for dinner, a sunset walk and desert on your return trip. If you plan to park your car around trailheads or in national forests, you’ll need to hang an Adventure Pass in the window to avoid a ticket. Get an Adventure Pass (good for several months) at Sporting Goods stores.